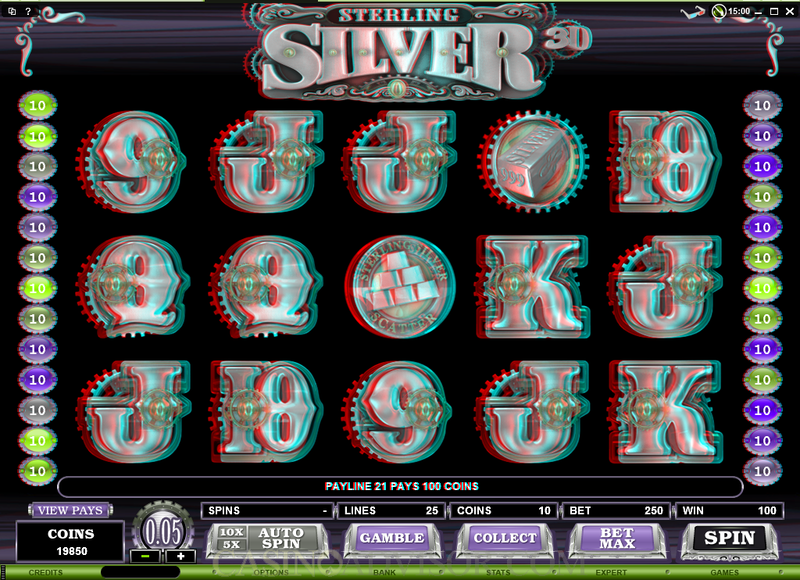 Sterling Silver 3D differentiates itself from the other 3D slots. It does not merely offer 3D like images on a 2D surface. It creates a real 3D experience of the type in 3D movies like Avatar or in 3D television, in which the images appear to come out of the screen in the real third dimension. In order to experience this players have to wear the special 3D glasses. The introductory clip provides the complete impact of the 3D experience. Players who do not have the 3D glasses or are experiencing any problems with the 3D vision should switch to the regular 2D mode using a button on the screen or through the options tab. 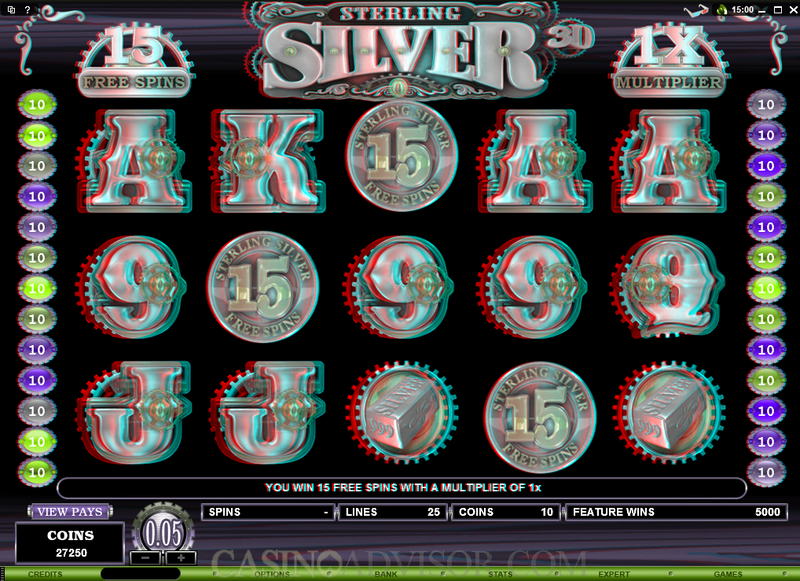 Sterling Silver 3D allows the manipulation of all three betting options. The slot game has 25 paylines and, though players need not activate all of them, it is advisable to wager with all paylines enabled. Players can wager up to 5 coins per payline. The coin size range starts from 0.01 credits and goes up to 0.25 credits. The maximum line bet works out to 1.25 credits and the maximum total bet works out to 31.25 credits. This may not attract high rollers after the initial draw of playing on a 3D slot wears out. The Sterling Silver logo is the wild symbol. It appears stacked on the center reel. It randomly awards a multiplier to the payline in which it appears. This multiplier varies between two times and ten times. Two wild symbols completing winning combinations on different paylines can award different multipliers. These multipliers are very important because the normal payouts are on the lower side. 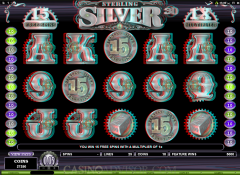 Sterling Silver 3D offers a free spins bonus round that is triggered when three scatter symbols appear anywhere on reels 2, 3 and 4. The player is awarded 15 free spins at doubled payouts. The free spins can be retriggered should the required combination of scatter symbols appear during the free spins. This combination also awards a scatter payout that is ten times the total bet. The Microgaming gamble game option is available after each payout. Players can stake the payout won in an attempt to double it by guessing the color of the next card or quadruple it by guessing the suit of the next card. The gamble game option can be exercised till the prescribed limit is reached. If the player guesses wrong then the payout staked is lost. The standard Microgaming features like auto play, expert mode and quick spin are offered. The player has the option to display his balance either in coins or in credits. Interested in reading more detailed information about Sterling Silver 3D? If so Click Here for more details.